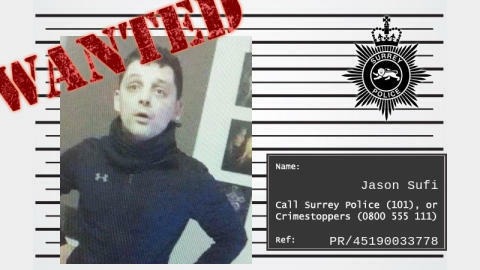 The burglary took place on Monday, April 1 at a property on Chessington Road, Epsom where in excess of £25,000 worth of jewellery and a number of other items were stolen. Jason Sufi, 39, is wanted for seven other offences by other forces, including being an absconder from prison in February this year. He was last seen wearing a long sleeved black top, black shorts and white socks and trainers.